The event was well attended and the intention of promoting a dialogue between the users and providers of services worked well. Inevitably only a limited number of issues was discussed even though the Chairman gave as many participants as possible the opportunity to make a contribution. The panel members responded comprehensively to the questions from the floor. However, it would have been helpful to include a representative of the HCC Highways Department rather than two from the Transport Policy side. As a result of the publicity beforehand several communications expressing specific concerns were received from individuals most of whom were unable to attend the meeting. These concerns are listed in Section 3 below. Notes of the proceedings were taken and these are included in Section 2 below. Parking in the Avenues, Crabtree Lane, Amenbury Lane, outside schools, etc. Transport to hospitals - no set pattern so buses probably not total answer. Also available is Community Transport Scheme, Herts Dial-a-Ride and Helping Hand. Station Parking - double storey car park still being progressed, timescale not currently known. Pedestrian access to station via Aysgarth Close being proposed. Avenues area west of the station does not have controlled parking but point made that many people working in Harpenden businesses park there, if this was restricted then these people would have to pay for all day parking at considerable cost. This may affect the retail businesses in the High St which is not desirable. Stated that junction of Station Rd with the east side station car park access road was dangerous and would become even more so with the new single storey car parking facility being planned. One panel member stated that traffic lights had been proposed here but feedback was that Harpenden residents didn’t want them, surprise expressed by the audience at this suggestion. Crabtree Lane parking - lots of cars now park in lower Crabtree lane for the station- it was stated that parking restrictions for this area were in the District council pipeline. Timescale not currently known. Crabtree School parking - point made that parking restrictions are not enforced around Crabtree School. Offer made by Councillor David Williams to explore double yellow lines at the entry to Chesterton Avenue. St Hilda’s School parking - point raised that parking here is causing issues. Response made that this school has a wide catchment area and most parents have to drive their children to school. Buses - why is the bus service to the station poor/non existent. Response was that people will not use a bus service which is not frequent (approx. maximun every 20 mins) and this is not feasible throughout Harpenden. This type of service has been tried in several towns and they have all failed. Also Harpenden Station has not got enough land around it to locate a bus station. Point made that to maintain and improve the usage of a bus service it needs to be frequent (20 mins max between services). The 321 from Luton to St Albans needs to increase its frequency so that it is more fully used, this may require the Luton-Hemel Hempstead route to split into two routes, Luton/St Albans and St Albans/Hemel Hempstead. Strategic Local Plan implications - 2,400 additional houses are being planned for Harpenden. 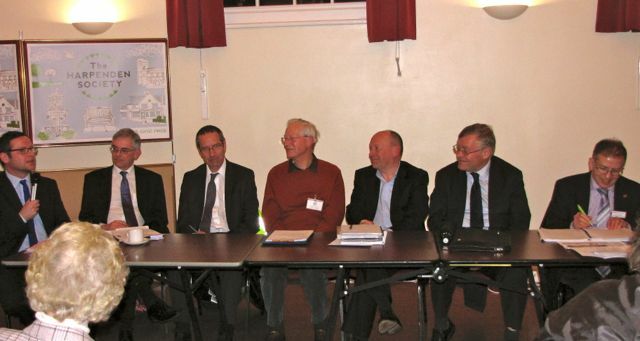 Questions raised about how this will affect all transport issues in the Town. Luton Road is already at capacity, how will it cope with more traffic, Lower Luton Rd is heavily congested at certain times of the day, how will it cope with more houses and the expansion of Luton Airport. Response made that some airport traffic will divert to the M1 if A1081 and the Lower Luton Rd become congested. Point raised about whether there was any limit to the possible expansion of Harpenden, would expansion just lead to further expansion. Integrated Plan - point made that there does not seem to be joined up thinking about the various transport options in Harpenden - car, bicycle, pedestrian - and an updated integrated plan is required, especially in light of the possible new housing plans. Kinsbourne Green - J9 M1 access road - this has been proposed. Lot of traffic currently uses Annables Lane, this would relieve this and possibly reduce other through traffic in Harpenden. Bike Lane - point raised that a WIDE bike lane along the A1081 (Kinsbourne Green to Station Road) would substantially increase the number of cyclists and reduce car use. However, the gulleys are blocked along this road which makes cycling difficult. Councillor David Williams has raised this issue with the new Herts CC Highways contractor. Junction of Station Approach and Station Road especially for cyclists at commuter times; suggestion of entrance to be provided from Aysgarth Close end of car park.